I'm getting ready to do the 100K maintenance service. **I found that the transmission fluid drained into the pan was really good looking as though it had been changed recently so I opted not to change the filter. Also, it took more than 5 qts to refill with just a fluid change. I put in 7 quarts and its still a bit low. Time for another trip to the parts store. Front diff does not have a cover like the Grand cherokee or most other 4wd's I've worked on. It has a drain and fill plug only. Rear diff cover gasket is 77.00? WTF. Rear Diff Gasket is re-usable. Its a standard rear diff where you remove the cover to drain fluid. There is plenty of room to remove the diff cover without disassembling anything else. I re-used the gasket but ran a slight bead of blue silicone caulk around both sides of the gasket. I also cleaned the cover real well and spray painted rubberized bed liner on the outside before re-install. The fluid drained looked like a good quality thick maple syrup. 8) Lube locks, hinges etc.. I bought a tube of Superlube (12346241) from the dealer because he was kind enough to look all the capacities up for me and gave me a free car wash.
9) Inspect coolant (Dexcool 50/50) no problems here. This is due for service at 150K. Oil change was done by dealership prior to me purchasing. Found this interesting tidbit about the operation of the RPO M99 model 2ML70 transmission for The Tahoe. Thought I'd share. Free online workshop manual for Tahoe Hybrid. WEWT!! Not a fan of royal purple. Had problems with it in evolutions. A/C Delco is synthetic so I would stick to oem. Solved my lurching when coming to a stop problem. I was thinking it was something in the transmission. On a hard stop, once the speed hits 30 auto shutoff takes over and stops engine. The engine accelerates then shifts off, probabley to load fuel into the lines for restart). When this happened it felt like the ho would speed up then the rear tires would bark when it stopped. Shudders the whole car and scares the hell out of you. A few weeks ago my brakes were squealing so I thought maybe they were worn down. I bought new pads/hardware. Found out there was plenty of material on the pads (just a rock) but I went ahead and did it anyway because the weather was good. The rear pads were so stiff I bent my screwdriver prying them out. Rust buildup under the hardware. The rear pads couldn't move at all. They're supposed to be loose enough to slide but not rattle. I ground the ears down on the new pads because they were really stiff too. Possibly calipers are a bit too tight. anyway, the tahoe hasn't lurched or surged since I did the rear brakes. So if you you have that problem check rear brake pad movement first. I was thinking transmission was screwed up. Really sweating that one. Great info and thanks for sharing. Funny how a lot of times it is just some basic hard to diagnose issue that causes symptoms. I think the dealers make a fortune off this stuff. I have only gotten around to the front differential fluid change so far. Fluid looked pretty good coming out and only a small amount of metal shavings on drain plug. Used Valvoline 80W-90. Kind of got caught up in the correct fluid controversy for the rear differential. Finally went with Lucas 75W-90 synthetic supposedly it does not have the LS ingredient or at least has a real small amount. Best I can tell the GM G80 locker rear differential could be damaged by the LS additive? Sigh rarely a clear straight answer on the internet. I know it. total PITA finding the fluid types and capacities. Good luck with your project. Also recently had a couple other problems. While driving to work I take off from a stop sign. The engine starts up, starts shuddering real bad and the CEL pops up along with a reduce power notice. Pulled the code with my actron. P1516 THROTTLE ACTUATOR CONTROL.Actuator position performance. P2101 THROTTLE ACTUATOR CONTROL MOTOR CIRCUIT RANGE/PERFORMANCE. hmmm. shut off engine, pulled battery and cleared up for a couple days then popped up again. I found that the throttle body had buildup of carbon and was sticking closed. Cleaned it nice and smooth and no problems since. Last month My Service stabilitrac comes on but no CEL or code. Absolutley nothing is wrong.. everything works fine for a while but more and more weird things started happening. Doors wouldn't unlock but would lock. both Key fobs work intermittently then not at all. Took it to dealer. He reloaded firmware and all was well. Couple days later I'm at the store and open the rear passenger door. I see a damp area under the door. Hmm... hasn't rained in weeks and i don't have any fluid to spill. Popped the little trim tab on the bottom of the door and about 4 gallons of water poured out. Door was full to the top probably causing my electrical problems. The little drain hole in the bottom of the door was plugged with dirt so I left the grommet out. Haven't had any problems since. I check them after it rains now. Good thing I caught that before winter. That would have gotten ugly early. Man now I have something else to check LOL. I will be checking all door drains tomorrow. I did clean the throttle body on mine when I changed the air filter a few days back. It was surprisingly clean but I gave it a good toothbrush scrubbing to make it shine while I was in there. I seem to have developed a bearing noise now in front drivers side, might need a new wheel bearing. I have noticed that the stabiltrac lights seems to blink on and off on hard right turns too and I think the wheel speed sensor is part of these wheel bearings so it might be affecting it. I might jack that drivers side wheel and check it out in a few days. I hope it does not fall off or something in the meantime Haha. I replaced the passenger side front wheel bearing right after I bought it about 2500 miles back so I guess the original factory wheel bearings are only good for around 198k miles...........I still like the ole Ho but she sure is a lot of trouble at times. A couple of items left on my list now for fluid changes. Coolant / transmission fluid / Brake fluid and of course the "blinker fluid". 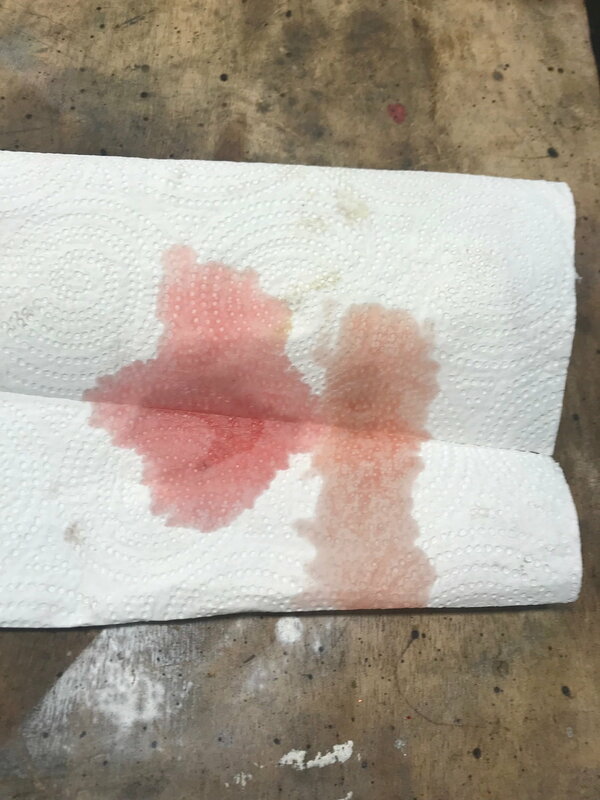 I took a sample of the transmission fluid off the dipstick onto a paper-towel (right side in pic below) and then poured some new DexronVI on the paper-towel (left side in pic below) . The fluid appears to be slightly brown but not black or burnt smelling so I am pretty sure it has been changed in the past. No way it would look that good at nearly 200k miles? Anyway i am NOT doing a full change out I may be overly cautious but I am pulling the trans cover drain plug and whatever drains form there just replacing with new. Might do it again at next oil change dependent upon how much actually drains out. Too many horror stories on the internet about transmissions that have not had regular fluid changes being killed by fresh fluid! Might actually be something to that rumor Haha. 2009 Altima Hybrid - any 110k mile maintenance needed?